Irish Setters were originally bred to hunt upland game, and they are still proficient hunters. Many observers find Irish Setters to be among the most beautiful of all dog breeds. Their dark red color, profuse feathering, and happy-go-lucky nature make them quite attractive to many dog lovers. However, Irish Setters are not the breed for everyone! They are very energetic dogs who require plenty of exercise, attention, and affection. With the institution of AKC Hunting Tests and the Irish Setter Club of America’s Versatility Certificate program, many owners of non-field-bred Irish Setters in the United States have been delighted to learn that their dogs still possess a strong hunting instinct. Irish Setters are among the largest of the sporting breeds, with males ideally measuring 27 inches at the withers and weighing about 70 pounds, and females measuring 25 inches at the withers and weighing about 60 pounds. The Irish Setter is characterized by its “brick-on-brick” head and its silky coat, which is short on the body and longer on the chest, ears, backs of legs, tail, and undercarriage, and which ranges in color from chestnut to mahogany. Although its potential is often not fully developed, the Irish Setter is a very versatile breed. 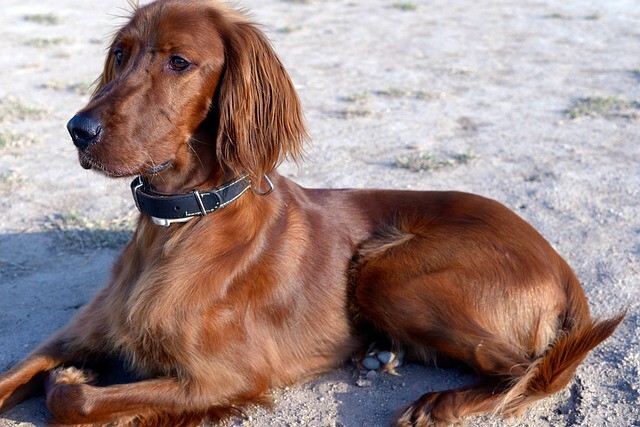 Not only are Irish Setters beautiful companions and able hunters, they also possess the ability to excel at competitive obedience, tracking, and agility. There are several Irish Setters with advanced obedience degrees, and many Irish Setters are now pursuing agility titles. Irish Setters are extremely active, energetic dogs, as are most sporting breeds. If they do not get adequate exercise and training, they can be difficult to live with. Their reputation as “hyper” dogs seems to have emerged when Irish Setters became extremely popular in the 1970s. With the decreased popularity of the breed in the 1980s and 1990s, the quality of the Irish Setter temperaments being produced is uniformly much higher. Anyone who has lived with them knows that these dogs are experts at getting their way! Irish Setters present a training challenge because they are stubborn, easily distracted, and quick to bore, but most of them are quite intelligent. It takes a great deal of patience and commitment to train an Irish Setter; however, such training is an absolute necessity, and it usually proves to be fun and rewarding for both dog and owner. Training must start early, and the trainer should keep in mind that most Irish Setters aren’t mentally mature until they are at least 2 years old. Their long feathering requires quite a bit of attention, otherwise it will quickly become matted. Daily brushing is the MINIMUM Irish Setter grooming requirement. No. Many Irish Setters will alert you to the presence of strangers on your property, but for the most part they are more likely to happily greet intruders (or to hide behind the sofa) than wrestle the family silver from burglars. Yes, though since both Irish Setters and children often have a tendency to play rough, interactions between them should be supervised. Quality Irish Setters from reputable breeders can be hard to find, so there is usually a wait for a puppy. Also, in some places, the demand for older rescue dogs is far greater than the supply. Whether you are dealing with a breeder or a rescue representative, expect to be questioned thoroughly about your expectations and your ability to cope with the breed’s maintenance demands. As with most of the sporting breeds that developed in the British Isles and Ireland, there is much speculation about the origins of the Irish Setter. The breed’s formative years were in the eighteenth century, and the breed was clearly established by 1800. Its ancestry can be traced to a dog known as the setting spaniel, and crosses were undoubtedly made with Pointers, English Setters, Gordon Setters, and other spaniels. Some breed historians have suggested that early crosses were made with Bloodhounds, Irish Water Spaniels, and Irish Terriers, though there is no documentation to support such conjecture. Among setters in Ireland, red and white coloring was dominant well into the nineteenth century; even today many Irish Setters are marked with small areas of white on the chest, neck, or between the toes despite the long-standing official division of Irish Setters and Irish Red and White Setters (not AKC-recognized) into separate breeds. Nineteenth-century descriptions of Irish Setters with black or, more rarely, orange coloring or markings point to the probability of cross-breeding with English and Gordon Setters. Modern Irish Setter type can be traced to a British dog of the 1870s named Ch. Palmerston. Palmerston has been described as large for his time — he weighed 64 pounds and measured 23.5 inches at the shoulder — with an unusually long and narrow head, heavy bone, and dark red coloring. Because of the impact of the few of Palmerston’s daughters who were imported to the United States, there is little doubt that all American Irish Setters can trace their ancestry to Palmerston. During the first half of the twentieth century, there was very little difference in “type” between Irish Setters who competed in field trials and Irish Setters who competed in conformation competition. In recent decades, however, as field trial competitors sought to breed dogs that were competitive against other pointing breeds in field trials, and as conformation-minded breeders produced larger, heavily-coated dogs that were more competitive in the show ring, the breed has split into two distinct types. The Standard is the physical “blueprint” of the breed. It describes the physical appearance and other desired qualities of the breed otherwise known as type. Some characteristics, such as size, coat quality, and movement, are based on the original (or current) function for the dog. Other characteristics are more cosmetic such as eye color, but taken together they set this breed apart from all others. The Standard describes an ideal representative of the breed. No individual dog is perfect, but the Standard provides an ideal for the breeder to strive towards. To find a copy of the standard, check with the AKC, the national breed club, or a good book on the breed. Epilepsy is present in Irish Setters. The Irish Setter Club of America has recently launched a closed database, managed through the Genetic Disease Control Institute, which will be used to attempt to determine if there is a hereditary component to idiopathic epilepsy in Irish Setters. With seizure disorders, and with all the conditions mentioned here, it is important that Irish Setter puppy buyers ask breeders about the frequency of occurrence of such disorders in the pedigree. Often also called gastric torsion (or bloat, a misnomer, because in bloat without torsion the stomach does not rotate), GDV afflicts Irish Setters more often than most other breeds. In this condition, the stomach twists and distends, acutely affecting key veins in the abdominal cavity and causing the failure of body systems. It should be noted that while GDV in Irish setters is sometimes accompanied by the classic symptoms of bloat, such as a distended abdomen and unproductive attempts to vomit, these symptoms often are not present, at least not in the earlier stages of GDV. Extreme restlessness is often the only observable symptom. Any Irish setter suspected of being in torsion should receive immediate veterinary attention, and Irish setter owners should not be shy about insisting on x-rays to ascertain a dog’s condition. Furthermore, since traditional home methods of relieving bloat (such as passing a stomach tube or releasing trapped gas with a hypodermic needle) are not effective in cases of torsion, Irish setter owners are advised not to waste time trying such remedies when they suspect torsion; getting veterinary attention for dogs in torsion should be the top priority. Precautions should be taken by Irish Setter owners to lessen the likelihood that their dogs develop this acute and life-threatening condition. These precautions include 1) feeding two or more smaller meals per day rather than one large meal, 2) wetting dry food and allowing it to soak before feeding, 3) not allowing vigorous exercise for one hour before and two hours after feeding, 4) elevating food dishes, and 5) using a high-quality food that doesn’t contain soy. GDV can be quickly fatal, but if caught in time a procedure called gastropexy, in which the stomach is surgically tacked to the abdominal wall, can be performed. This surgery radically decreases the possibility of GDV recurrence. Extensive information about GDV can be found on the homepage of Purdue University’s College of Veterinary Medicine at http://www.vet.purdue.edu/depts/vad/cae/cgdvweb.htm. Also somewhat common in Irish Setters. All breeding stock should be radiographically cleared of hip dysplasia by the Orthopedic Foundation of Animals (or the equivalent national orthopedic registry) at two years of age before being bred. Hypothyroidism is fairly common in Irish Setters. Proper diagnosis of low thyroid activity requires a thyroid stimulating hormone (TSH) response test in addition to the standard T4 test. PRA, a form of hereditary blindness, was once a serious problem in Irish Setters. Recently, however, a DNA test was made available to determine which Irish Setters are PRA carriers and which are not. In Irish Setters, PRA is a simple recessive and can, therefore, be eliminated from breeding programs by breeding known non-carriers to known non-carriers. Unlike some other forms of PRA, in Irish Setters the condition has an early onset; combined with the simple recessive nature of its inheritance, the early onset of the disease enabled some Irish Setter breeders to implement an effective, if controversial and not widely adopted, program of test-breeding to eliminate PRA from their breeding programs in the decades before the DNA test became available. HOD afflicts some Irish Setter puppies (primarily between four and eight months of age) and is sometimes fatal. Symptoms can include fever, lethargy, swelling of joints, and lameness. Many veterinarians are not experienced in diagnosing and treating this condition, so it is important that puppy owners be aware of HOD’s existence. Oversupplementation of puppies and high levels of protein in puppies’ diets have been linked to the development of this condition. Elderly Irish Setters often develop spondylosis, an arthritic condition of the vertebrae which decreases mobility. This condition often responds well to treatment with Adequan or its oral forms (such as Cosequin and Glycoflex), and/or acupuncture.